In an evening as effervescent as the bubbles in a glass of Champagne, Houston Grand Opera’s reimagined Die Fledermaus, Johann Strauss II’s sparkling operetta, tripped elegantly across the stage of the Wortham Theater Center, whisking the audience along in a flurry of comedic couplets, mistaken identity and revenge gone awry. And a good time was truly had by all. 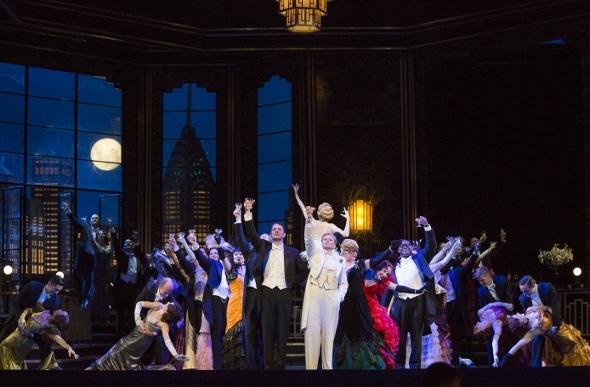 Setting the 1873 operetta in 1930s New York made for a marvelously madcap backdrop. Here, amid black and white silent film narration cards that set the scene, we find the Eisenteins, Rosalinde (Wendy Bryn Harmer in her HGO debut, her soprano lush and lingering) and Gabriel (baritone Liam Bonner, whose rich voice was matched by his exceptional acting ability), a husband and wife who are downright nasty to each other. The pair is invited – separately – to a lavish party thrown by Russian Prince Orlovsky (the magnificent Susan Graham, with a velvety mezzo-soprano and commanding presence) by Gabriel’s friend, Dr. Falke (baritone Samuel Schultz, offering wit and strong voice). Falke has set up the evening as an elaborate practical joke, seeking revenge against Eisenstein for a years-old prank. What unfolds is gorgeous comedy and commentary on who we are and who we reveal ourselves to be to the world. And oh! What music! Austrian conductor Thomas Rosner leads the HGO orchestra through waltz after waltz, pulling depth and nuance from the score. 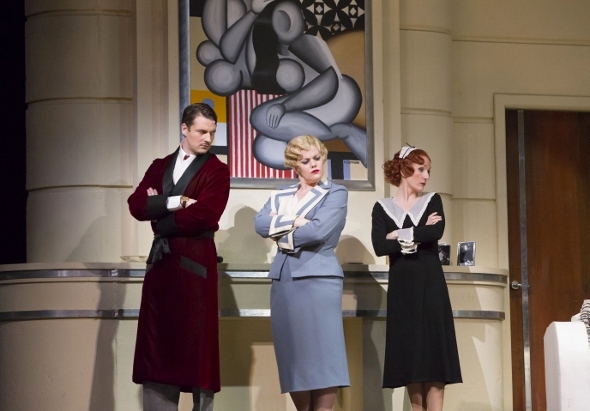 The singers are in full power – Laura Claycomb is a particular delight as the ditzy Southern maid and wannabe actress Adele – and they’re augmented by truly fine dancing, especially that of Philip Broomhead and Krissy Richmond, playing the parts of Fred Astaire and Ginger Rogers. The team of director Lindy Hume, set designer Richard Roberts and costume designer Angus Strathie set up a delightful canvas upon which the story unfolds. There’s a madness, an escapism, to the story, and both HGO Artistic and Music Director Patrick Summers and Hume point out in their notes the parallels between 1870s Vienna and 1930s Depression-era New York, places where those who were able turned a blind eye to market collapses and indulged in parties and Champagne. What a delightful indulgence HGO’s Die Fledermaus is.